Blondie and Brownie: Caramel Thyme? This lovely little sweet set me back just 50 cents at The Ploughman in Park Slope. I went to the store in search of some Jojo's Sriracha sauce after falling in love with Peach Sriracha jam. I found my very own jar of Jojo's and I couldn't help but be tempted by the caramels in pretty glass jars at the point of purchase. They had a spiced caramel, a bacon thyme caramel and the regular thyme caramel you see above. I asked the cashier for her opinion and she recommended the thyme caramel. I'm not typically a huge thyme person. Sure I'll toss it into recipes in a blend like herbs de Provence or Za'atar and I know a jar of it somewhere, but it's not an herb I bust out with much frequency on its own. 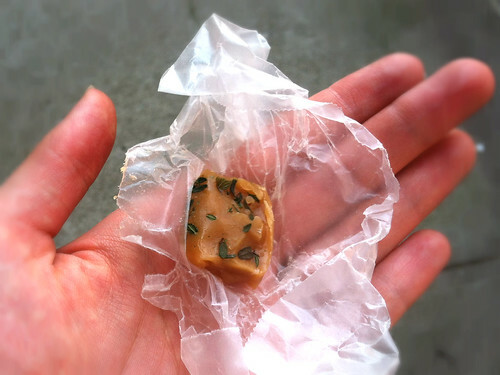 I was surprised how nicely the peppery-ness of the herb paired with the sweet, buttery, soft caramel. I wish I had taken notice of what company made the caramels--all the more reason for a return trip. In the meantime I'm going to be plotting ways to include thyme in some fall baking. Thyme & salted caramel apple pie, anyone? So glad you enjoyed our caramels! We make them at Betty Brooklyn Catering Co. Visit us at BettyBrooklyn.com.